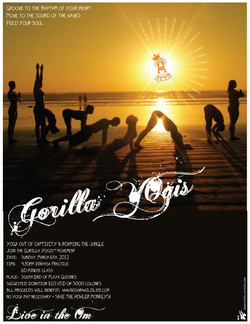 Join our Gorilla Yogis Mela. A network of spaces, places and like minded yogis - supranationally! On Sunday, March 6th, 2011 at the South End of Playa Guiones a great group of yogis joined the Gorilla Yogis movement! Over $300 was raised in Costa Rica... which is enough for the Nosara Wildlife organization to feed the monkeys in their rehab facilities for two months! Thanks to Live Savvy for donating 30 headbands for this friend and fundraising event. As Mother Theresa stated, "Small things done with great love." All proceeds benefited: www.nosarawildlife.com to save the HOWLER MONKEYS! Event took place on Saturday, January 22, 2011. 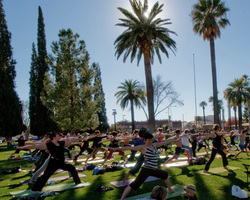 The inspirational yoga event had over 75 yogis offering peace, love and compassion to the world - one breath at a time!